The billion dollar Halloween season is upon us, with theme parks and attractions worldwide offering unique seasonal opportunities with varying levels of scares. In this original InPark video, we visit two venues in California’s Silicon Valley, located only 5 1/2 miles apart, but each offering unique experiences. In 2017, California’s Great America celebrated its tenth annual Halloween Haunt with the introduction of a new maze in its old Pictorium IMAX theater. “Backwoods” is themed to a mountain resort under attack by werewolves. In the photos of the lights on walkthrough, you can see elements of the old IMAX operation still in place, including the pit, the screen brackets, and the projection booth windows. One of the photos also shows a metal trellis from which a scare actor attached to a bungee flies through the air at guests. As with most haunts, the scenery is more impressive when the work lights are turned off and the theatrical lighting, atmospheric effects, and audio cues are in play. Next, we visit the Haunt makeup studio with fourteen year old Shay, who aspires to be a visual effects makeup artist. Makeup Supervisor Jenn Majdi gives us a full tour of the studio, followed by a prosthetic application on Shay. 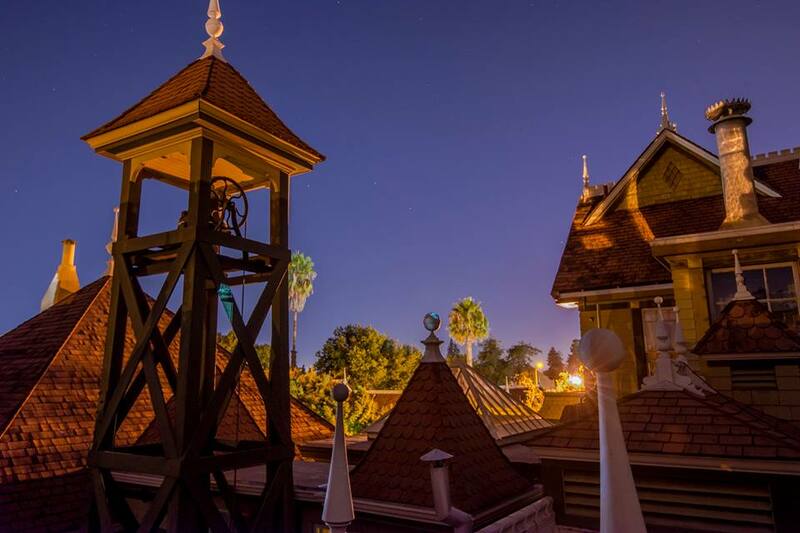 We conclude with the 2018 Halloween Candlelight Tours at the Winchester Mystery House in San Jose. This year, the attraction seamlessly blends an original storyline into the home’s own unique history of Sarah Winchester’s obsession with the afterlife. For the first time, the Winchester Mystery House is presenting the thirteen doors of the Asher Collection, purchased by Sarah Winchester, and each said to be a portal to the other side. We preview two of the doors in this video, followed by an interview with General Manager Walter Magnuson. A former Disney Parks executive who joined the Winchester Mystery House in 2015, Magnuson has successfully increased and diversified offerings while honoring the historic nature of the home.